We were delighted with the quick and efficient service. Nik is a friendly and reliable guy and we have already recommended him to friends and neighbours. A regular sweep of your chimney will improve the efficiency of your fire and will also help to prevent a serious problem such as a chimney fire. 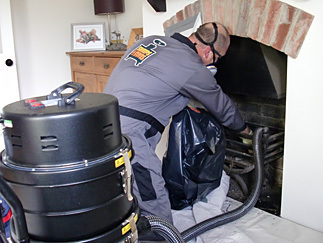 Many people are not aware but if a house is damaged by a chimney fire and the owner cannot prove that the chimney has been swept within the last year insurance companies will often now cover the damage caused. With every sweep we will issue you with a dated National Association of Chimney Sweeps certificate. Allowing soot to build up in a chimney can also put you at risk of a build up of dangerous fumes and also soot fall which can cause costly damage to carpets and décor.